The band’s name Randale made me expect an antisocial punk band, but the four well behaved musicians couldn’t be further from that. They label themselves a nonsense band, which may sound silly, but somehow makes sense. Randale try to create family-friendly rock music in a humorous way that should mainly appeal to elementary school kids. You are permitted to laugh, but only if you are able to appreciate a typical German sense of humour. There is no real musical direction to be detected, instead the band offers a superficial overview of the most different genres. Wunderbar lies somewhere between schlager and Die Ärzte, Kino sounds as if Buttermaker were playing swing, and Das Feuerwehrlied is an authentic children’s song. 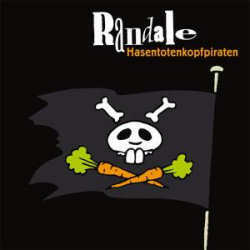 Even German styled rock’n’roll (à la Ted Herold and Peter Kraus), rap, reggae and ska have made their way onto Hasentotenkopfpiraten, the band’s meanwhile fourth CD. The songs are without an exception kept very simple and always restrict themselves to the absolute necessary. Some tracks backfire (Geburtstagslied, Nein, Mach dich locker) but others managed to conjure a smile on my face (Unsere neun Planeten, Flummi, Hühnerska). The lyrics have a very important role and are also highly intelligible to allow even the youngest to follow their meaning. Sometimes they have a pedagogic touch, making me wonder if we are in the presence of rocking elementary school teachers. Randale will definitely polarise their audiences: some will consider this band extremely funny, while others can only shake their heads at so much silliness. Subjectively speaking, Hasentotenkopfpiraten is entertaining for a couple of tracks, and I strongly advise against playing it to your children all day long.